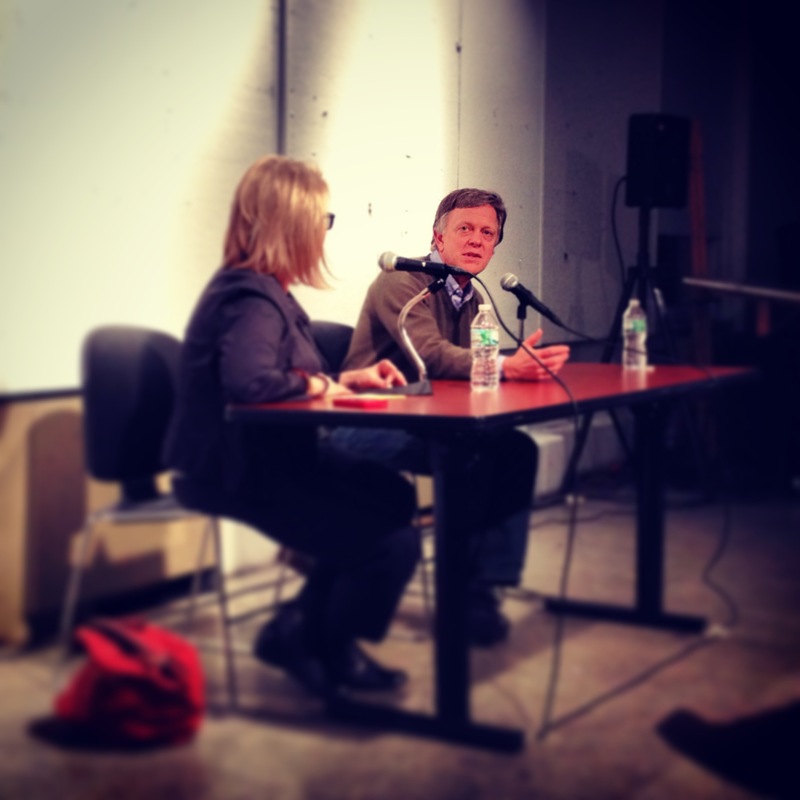 Ted Conover in conversation with Lis Harris at Columbia’s Graduate Writing Program’s Nonfiction Dialogue on Wednesday, January 29, 2014. This just in: Ted Conover, nonfiction writer famous for his immersion and undercover journalist, is cooler than your dad. Sorry, Rich Bartels, I still love you very much, but last night at the Columbia Graduate Writing Program’s Nonfiction Dialogue, Ted Conover proved himself to be actually the coolest dad in the world. Nonfiction Dialogues, for those not familiar, are a lecture series featuring conversation between Columbia professor and New Yorker veteran Lis Harris and an established nonfiction writer. On Wednesday night, Ted Conover talked about his experiences crossing the Mexican border with illegal immigrants, inspecting meat for the U.S.D.A., freight-train-hopping with hoboes, trailing the wealthy elite of Aspen, and working for a year in Sing-Sing maximum-security prison. Conover, a smaller, unassuming guy with a kind face, looks like someone you would see cheering on his kid at a soccer game and not driving trucks through the AIDS belt of Africa. Yet, he is one of the bravest writers I know. Recently, for his birthday, Conover’s Buddhist father – who seems like a pretty cool dad himself – sent him a magnet that said: “leap and the net will appear.” Conover stressed the importance of jumping into situations, but making sure you do, in fact, have a net before going in – a net such as an assignment from The New Yorker. Conover spoke of the challenges of undercover journalism – getting things wrong, hurting feelings – and how to handle research holes. “Sometimes,” he said, “you have to work with what you don’t have. Absence can be powerful.” Conover also emphasized, even after an immersion, to know your limitations: “When you’re a writer and you put yourself in a story, you have to be aware of the limits of what you can claim to know.” Though he got a good idea of what it felt like to be homeless while riding the rails, Conover has never actually been homeless and, therefore, cannot claim to know what it is really like. Most teenagers would cringe at the idea of hopping freight trains with their dad, but Conover is clearly not a regular dad, and so this past July, Conover and his son rode the rails together. The only disappointment was that his son got sick of it after three days. Conover offered to take Lis Harris with him train-hopping this summer, and I could not be more jealous. Maybe he will let me come along too. E.B. Bartels is a second year MFA candidate in nonfiction writing at Columbia University’s School of the Arts. She is the 2013-2014 Online Content Editor for the Columbia: A Journal of Literature and Art literary blog, Catch & Release. You can read her writing at ebbartels.wordpress.com, tweets at @eb_bartels, and visit her website at www.ebbartels.com.